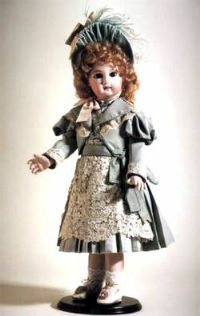 22 inch French Child's Dress with false jacket front, patterned after an original Jumeau couturier costume. 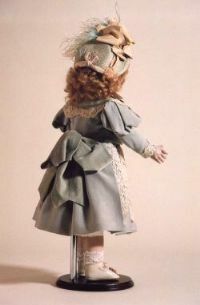 The skirt has small box pleats in back with large bow at waist, small pleated front bodice under an open jacket front, and looped side ribbon. Fits an FB 17 inch Body.